High-profile Union Flag protestor Jamie Bryson has beenconvicted of taking part in unlawful public processions. The 24-year-old was also found guilty of obstructing traffic during one of the demonstrations staged in Belfast. A district judge at the city’s Magistrates’ Court rejected claims that he had only been present as an individual unaware the events could have been illegal. Fiona Bagnall said: “The defendant’s evidence lacked any real substance or credibility on any of the issues relevant to the case. Bryson, of Rosepark in Donaghadee, Co Down, will be sentenced next month. He had contested a series of charges linked to widespread demonstrations over the decision to restrict the flying of the Union Flag at Belfast City Hall, claiming he was the victim of a political prosecution. 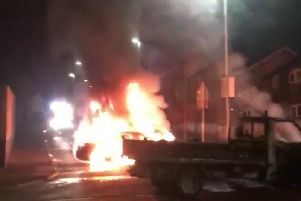 The charges included four counts of participating in four un-notified public processions during January and February 2013, and obstructing traffic on the city’s Newtownards Road. In his evidence Bryson insisted he did not know the protests could have been unlawful. He accepted featuring on CCTV footage of the events, but repeatedly stressed that each time he walked to and from the centre of Belfast as an individual. During the trial prosecution counsel accused him of treating police who interviewed him with contempt. The court heard he told officers quizzing him about the marches that he was an Irish republican and the First Minister. He even suggested a fictional gay relationship with fellow campaigner Willie Frazer, it was claimed. In a highly unusual move, one of Northern Ireland’s most senior police officers was called to give evidence as part of the defence case. Assistant Chief Constable Will Kerr told how he agreed to meet Bryson and loyalist community representatives as part of efforts to ensure their weekly demonstrations did not break the law. He also insisted that he warned those at the meeting on January 29, 2013 of the “criminal justice consequences” of taking part in un-notified public processions. As Bryson entered the dock for the verdict, Judge Bagnall held that he had been told “explicitly” by ACC Kerr that no notification had been given for the events. CCTV footage clearly showed Bryson in the crowds as part of the processions, she ruled. “He was closely involved in the arrangements regarding the protests, and I do not accept his explanation that he did not know the status of the processions in question,” the judge added. Convicting him on all charges, Mrs Bagnall said the footage showed Bryson standing with others in the middle of the road. Bryson was released on continuing bail to return for sentencing in four weeks time.